Kiel Canal’s so-called ‘Eastern Section’ off Kiel is a relict still reflecting the Canal’s condition at the beginning of World War I. Here, the width at bottom amounts to only 44 and the width on waterline to 102.50 metres. The remaining part of Kiel Canal has, in contrary, been widened in 1965/66 to a bottom width of 90 and a waterline width of 162 metres. Due to its restricted width and very narrow curves the ‘Eastern Section’ constitutes a bottleneck affecting the entire Canal. 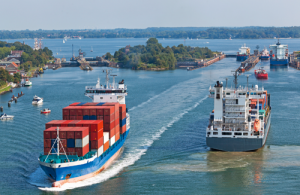 Ships are only allowed to pass each other in this section if the accumulated Traffic Group figures do not exceed six (in Kiel Canal, each ship in passage is classified in one of six traffic groups according to its dimension and – in case of tankers – cargo). For example, a Group-6-vessel (e.g. a big cruise vessel) cannot be passed by any other vessel in the ‘Eastern Section’. In such cases, encounters of vessels have to take place in the sidings, a procedure often causing delays and extending the Canal transit time. the width at bottom has to be increased from 44 to 70 metres. This would allow ships until an accumulated Traffic Group figure of eight to pass each other (e.g. two vessels belonging to Traffic Group 4 or one belonging to Traffic Group 4 and one to 2 would be authorised to pass each other). 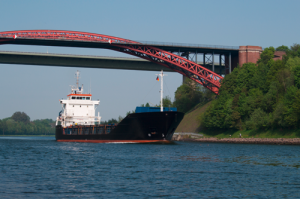 An investigation of the Kiel-Holtenau branch of the German Shipping & Waterways Authority revealed that each euro invested into the modification of Kiel Canal’s ‘Eastern Section’ will generate a benefit of five euros. The investment is thus highly profitable. The planning assessment procedure for the alignment of the ‘Eastern Section’ has been initiated in early 2010. A scoping study defined by German legislation for the replacement of the Levensau road and rail bridge was instituted in summer 2011. The planning assessment procedure for this bridge will be conducted separately and follow somewhat later. …a rapid realisation of the alignment of Kiel Canal’s ‘Eastern Section’ in order to ensure the Canal’s continued availability and service capability. Respective staff and financial resources have to be made available.